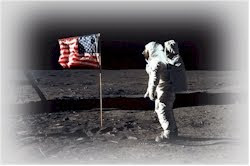 Gingrich Space Policy Events & Let All Candidates Know YOUR Ideas. Newt Gingrich will hold two space policy events on January 25. Space advocates are urged to attend if at all possible. Ask questions to clarify anything he leaves unmentioned, as well as to push him on why America must lead in space; why just supporting commercial rockets to low earth orbit is not enough; why we must not let China take the lead in space; why a bold space program can help unify the nation; why a bold space program is "American Exceptionalism" defined; and urge him to create a lunar base by 2020 and go to Mars in the 2020's. Everyone should contact all candidates in favor of a bold space program. Gingrich is leading the way in discussing this important issue, and other candidates should compete by promoting even better space program ideas--and not to oppose the space program because their opponent is for it.